Isn't it sad that our affluent lifestyle has also affected our pets? The cats and dogs that my family had when I was growing up were never fat. They ate leftover food and if they don't like it, too bad for them! According to this news story, half the cats and dogs in the UK are overweight. The health problems affecting obese pets are similar to humans. 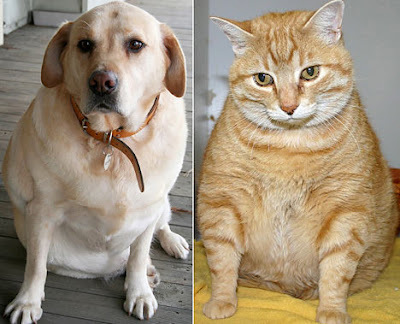 "Whether your pet is obese or slightly overweight - it matters. A weight problem can affect a pet's quality of life and lead to straining of the joints, causing arthritis, as well as internal illnesses like diabetes, liver disease and heart disease," said Joe Iglis, a TV vet. The first time I heard of an animal suffering from arthritis and diabetes was when I first visited England in the late 80s. I couldn't believe that animals had that kind of diseases! I guess because we never brought our pets to the vet, we never knew what exactly caused their death. The only pets we have right now are some gold fish and twelve geese. There is no danger of them getting overweight! pets diatu makai makanan dlm tin,ni nda gemuk....tapi rindu gak meda sidak iya gemuk.so huggable! Plump enda ngawa, anang aja obese! Kasih nuan meda sida bejalai, baka ka enda tebai tubuh diri empu. Kaki pen kingkang bai bejalai. My friend's dog was so overweighted, she had UTI all the time. The vet doctor said because she is so overweight, her *toot toot* was covered with all fat. Since then, my friend put her on diet and she lost all her excess weight and get rid of the UTI. Cat, my goodness, UTI!! I cannot believe that dogs can have that too! Heheh. Ya lah, in fact we are "abusing" our pets if we allow them to be that fat! aku agik ingat "mendiang" mayau kawan fanny suba,gemuuuukk amai(baka owner iya mpu gak,obese!)...apooo! enda terangkat ke iya mpu..